With temperatures warming up, it's time to start thinking about your outdoor space. That means getting your patios, porches, roof decks, and backyards ready for outdoor living and entertaining. What’s our mantra at Decorist this time of year? Bring the indoors outdoors and do it in style! We're not just talking about that usual outdoor thing… we want you to have lounge-worthy and entertaining-worthy spaces where you can spend time with friends and family relaxing outside under the sun and stars. With some fresh ideas and help from Decorist Elite designer Simone Howell, elevating your space can be fun, easy, and affordable. Simone likes to create a natural extension of interior design to the outside world. It's the moment when interior design becomes exterior design! Read on for Simone's simple ways to make that happen. Carry a predominant color from inside of your home to your exterior furnishings. Are you shocked that black is one of my favorite colors to use both inside and outside when decorating? Is purple an accent color in your home? Whatever your accent colors are, pull them into your patio in the form of throw pillows and tablecloths. A fabulous table linen can hide a Craigslist patio table in a heartbeat! A fun mix of chairs can bring an eclectic vibe to your patio or backyard. 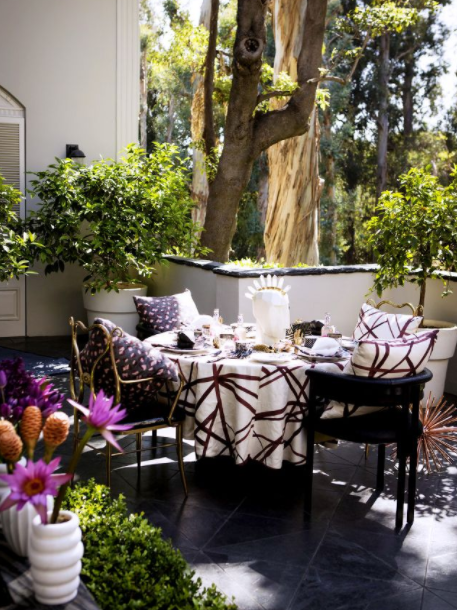 Be sure to accessorize your outdoor seating as you would your indoor seating with layers of pillows in mixed patterns. I honestly could spend all night at a table like this! Those are the types of outdoor environments that I strive to create. Don't stop with the furniture and accessories—plants obviously play a role in our outdoor spaces. 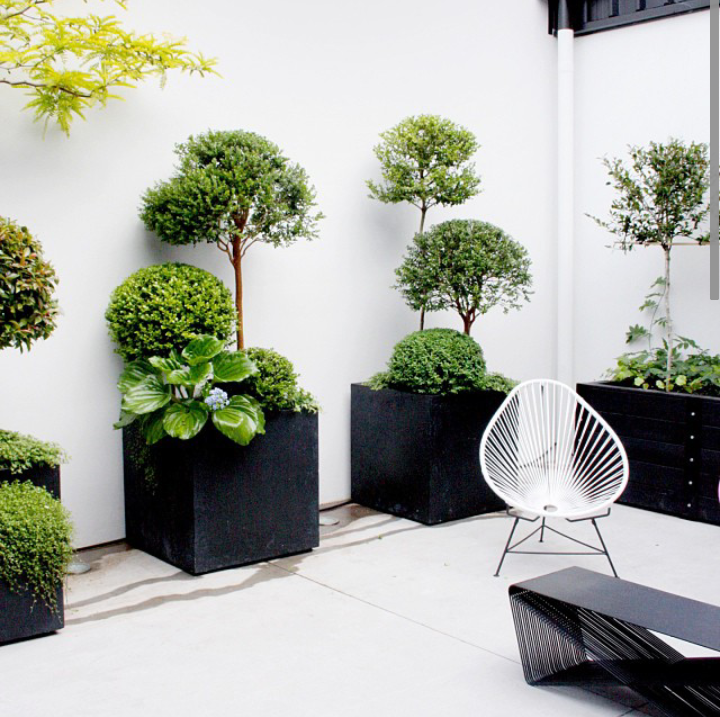 Topiaries in different sizes and plants with texture placed in simple pots create stunning focal points. I'm currently obsessed with the texture of astilbe and the shape of giant allium bulbs. I am frantically tucking them into our landscape while it's still cool enough for them to take root here in Texas! Large pendants or a statement light fixture work fantastically in covered patios and help anchor the space, while giving it a cozy indoor feel. Of course, an easy trick is to string lights in an outside space. This will help set the tone and create that festive feel perfect for entertaining. Are you ready to allow your style to run right out the back door? If so, start a Decorist Design project today! Now is the perfect time to make it happen.